MMA Ratings: UFC Nashville: Who Should New Welterweight Contender Anthony Pettis Fight Next? UFC Nashville: Who Should New Welterweight Contender Anthony Pettis Fight Next? 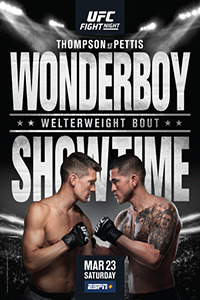 He wasn't supposed to win, but Anthony Pettis defied the odds with an emphatic second-round KO over Stephen "Wonderboy" Thompson in the main event of UFC Nashville. Pettis was moving up a weight class after a vicious TKO stoppage loss to Tony Ferguson at UFC 229 last October, facing a Top 5-ranked welterweight in the world in Thompson, and he was the biggest underdog on the whole card. But he shocked the MMA world when he became the first man to finish Thompson, with a superman punch no less, immediately announcing his arrival as a contender in the UFC welterweight division. Naturally, a fight that fans want to see is Pettis against Masvidal, who is fresh off of an upset KO win over Darren Till at UFC London. Both Pettis and Masvidal picked up ridiculous knockout wins in the last two weeks in main events as underdogs, so it only makes sense fans want to see this fight. Both men are long-time veterans of the Octagon who always bring the fight, and a matchup between Masvidal and Pettis has "Fight of the Year" written all over it. It's possible the UFC will match Masvidal against Ben Askren or Leon Edwards, but Pettis presents a more fan-friendly fight and perhaps the UFC will choose to go this route if it's truly the fight the fans want to see. In his post-fight interview, Pettis expressed interest in fighting the winner of the upcoming welterweight fight between RDA and Lee. Of course, Pettis dropped the UFC lightweight title to RDA back at UFC 185 in what was a huge upset at the time, and he wants to get the chance to avenge that loss. RDA still has to get by Lee though, so Pettis against the winner of that fight makes a ton of sense, as it would be a bout that would pit former lightweight studs against one another. Regardless of whether it's RDA or Lee, either guy against Pettis makes for a fun matchup for the fans. 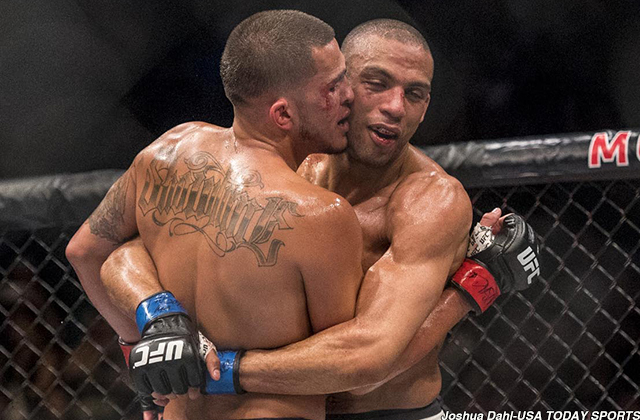 Pettis also expressed interesting in fighting the winner of next weekend's fight between Barboza and Gaethje. This would mean Pettis would have to move back down to lightweight, but if that's what he and his team feel is best for him, a matchup against either Barboza or Gaethje would be a lot of fun. Pettis already fought Barboza and lost a decision to him, so a rematch would give him the change to avenge that defeat, while a fight pitting Pettis against Gaethje would be ridiculously violent. Pettis should probably stay at welterweight, but if he goes down to lightweight then he should fight the winner of this bout. After the win over Thompson, McGregor tweeted that he was interested in fighting Pettis, and that would be one hell of a fight between the only two fighters in UFC history who have won fights at 145, 155 and 170. Both Pettis and McGregor are former champions and two of the most exciting fighters in the sport, not to mention two of its biggest names. McGregor needs an opponent for his return to the Octagon this summer (assuming that he doesn't retire), and Pettis is a guy who should be at the top of that list. And finally, Pettis could fight either Nate or Nick Diaz. The problem with both of those guys is that they rarely fight -- at this point, both of their faces might as well be on the side of a milk carton with the caption "missing" -- but perhaps one of them could be coaxed into coming back to take on Pettis in what could be one of the best fights of the year. As much as the Diaz brothers don't like fighting, money talks, and if this is the fight the UFC wants to book, maybe the fight is more realistic than we think. The UFC can't go wrong in matching up Pettis with any of the above fighters because anytime he steps into the cage you know you're going to get a great fight. Who do you want to see Pettis fight next? Leave a comment below.